This reel can work together with any end fitting or mounting base / holder (as shown on our website) from us. It can be installed to the confined space on the back of display cabinet. Fixing can be made by screw or adhesive tape. Box is made of ABS plastic, with stainless steel cable winding onto the reel inside. There is a stable & invariable retraction force for the cable. Security Tether also known asBurglar-proof steel cable, Burglar-proof string,recoilers, security tether and pull-box, Security Retractors, it can be broadly used for point of retail product positioning, purchase security, wire harness positioning in electronic equipment, equipment counterbalancing, signage support, and product or parts feeding. For example, it can be used in supermarkets, such as Wal-Mart Electronic products display and some other daily products display. 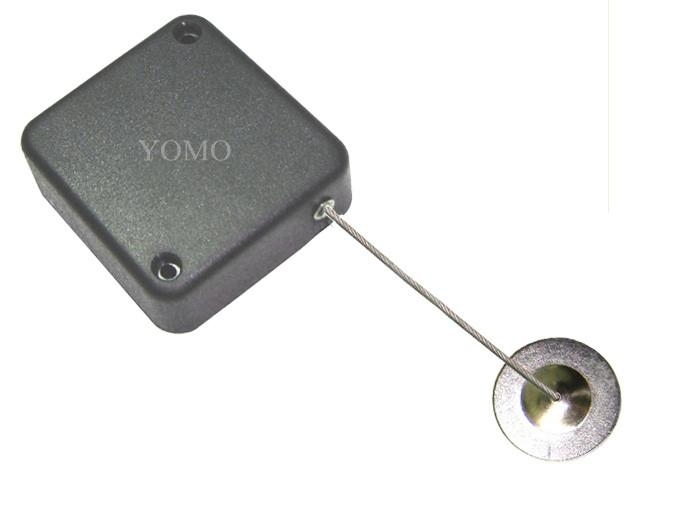 YOMO-098 Security Tether has a curve square shape attain a Nice Design, Plump and Smooth Box also cause a visual enjoyment, it also has many options on cable length and diameter. 4) Mainly designed for secure displays of live merchandises such as mobile phones, cameras, mp3/mp4, PDA, GPS,jewelrys,glasses,toys,crafts,rings and so on .Idea for low value items, or low risk environments. 5) We can make different pull force according to different goods and different ending parts for your options. Materials: Box is made of ABS plastic, with retractable spring built inside and stainless steel cable winding onto the reel inside. This Security Tether ends can be changed any other Security Tether Connectors or mounting base / holder from us, such as following Security Tether with different Connectors. If you don't know which is the right anti-theft pull box for you, Could you please let YOMO know the details as following? then we will recommend the right porduct to you within 24 hours. This determines what Anti Theft Pull Box series can be installed. This detemines which ends can connect your product, because our Anti Theft Pull Box can work with dozens of ends used to connect products to different uses. if you can send some picture about your product, that would be great helpfull to recommend the right Anti Theft Pull Box for you. With 10 years experience in product sales and R & D, 16 hours online waiting for any customers every day even on weekends, highly efficient in emails reply to ensure offer our security display solutions to every customers. We can do OEM, ODM, Urgent order, Small order, Sample order are wellcome. Payment is diversiform, easy to operate, safe. T/T, Western Union, Paypal will be accept. YOMO is the enterprise with innovative idea, strong research and development strength, can customize products for customers, Reliable quality assurance system, perfect after-sale service, agile management system, can provide first-class service. 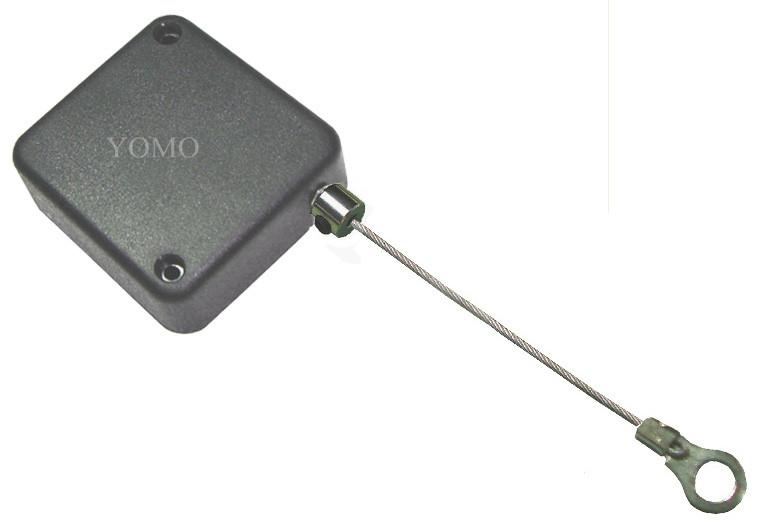 Why choose anti-theft pull box made in YOMO? Choose to buy anti-theft pull box in YOMO SECURITY, is to choose a purchase process with save time / save money and no worry. Since 2009, YOMO SECURITY DISPLAY always have been focusing on Fine material selection, Attentively production, Efficient service. Using 3M double-sided adhesive tape from original 3M factory, with high stickiness, no worries about fixing. Using high-qualitied whirlpool retractable spring to ensure more than 100,000 times' Pull life. Stainlee steel cable,built-up with 49pcs (7*7 structure) fine steel wire, more stand wear and tear. Every moving parts built in the box put with special oil to ensure the Stainlee steel cablelengthen and shorten smoothly. All the plastic parts mold one-time by full-automatic injection machine, reduce error to lowest, can be rated as Seiko secret agents.